High molecular weight glutenin subunits (HMW-GS) are well-known to directly influence the bread wheat quality. In a previous paper, our group reported the replacement of the locus Glu-A1 by the locus Glu-D1—allele Glu-D1a encoding the HMW-GS (2–12)—in a partial isohomoeoallelic lines of the French bread wheat variety cv. Courtot. We plan to exploit the novel translocated 1AS.1AL-1DL chromosome in durum wheat in order to develop durum lines presenting novel properties. The translocated chromosome was first introduced into durum wheat. However, as the distal translocated 1DL segment represents 25% (i.e., 84 Mb) of the recombinant 1AL length, it appeared worthwhile to shorten it through homoeologous recombination induced by the ph1c mutation. Two rounds of recombination were made. The shortest interstitial 1DL segment detected through SNP genotyping measured 9.19 Mb and could not be visualized by genomic in situ hybridization. 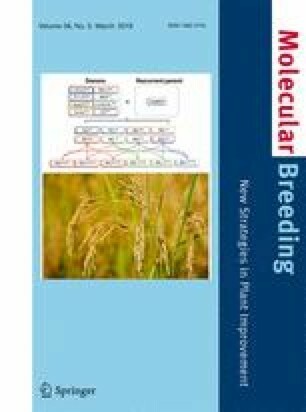 Such reduced transfer not previously achieved hitherto provides regularity of the meiotic pairing and will allow the use of those subunits absent in durum wheat species for direct exploitability in breeding. This project was supported by the CASDAR project. We thank the UMR INRA 1095 “GENTYANE platform” (Clermont-Ferrand, France, http://gentyane.clermont.inra.fr/) for the generation of genotyping data. JJ and GB conceived and designed research. AF, JL, and VH conducted experiments. EP contributed to analytical tools. JJ, GB, and OC analyzed data. JJ and OC wrote the manuscript. All authors read and approved the manuscript.